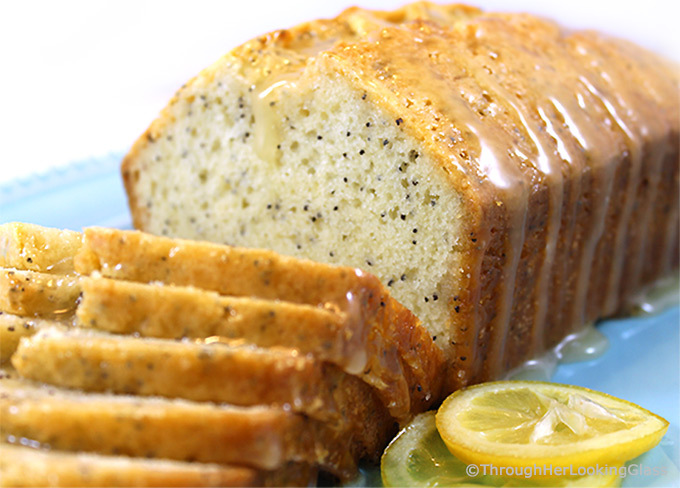 You’ll love this Almond Glazed Lemon Poppy Seed Bread. It’s a moist and scrumptious sweet bread with a crackly almond glaze. 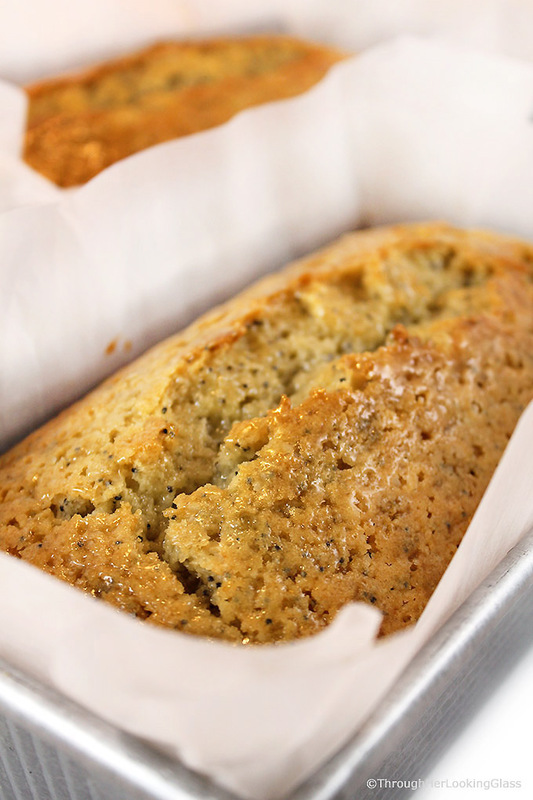 This is a notch above your typical lemon poppy seed bread. And if you’re an almond extract lover like me, you’ll love it! It’s still been cold and snowy around here. I do hate to bring up that s-word, ‘snow’ in the middle of April. Can’t wait for the arrival of the warmer spring weather and blooming flowers! Hope springs eternal. We moved into our new house last July. An interesting thing about moving to a new house in mid to late summer is that you don’t know what to expect in the way of spring bulbs or flowers in the yard. I look forward to the mystery shoots wending their way to the surface. And strolling around our new yard and woods, discovering what’s been hibernating under a blanket of white all winter. So let’s talk quick bread! 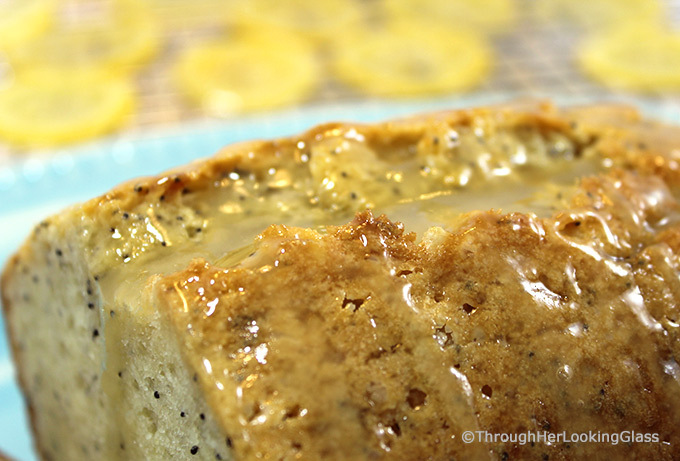 This Almond Glazed Lemon Poppy Seed Bread is a very simple recipe and lovely in the spring and summer. You won’t even need an electric hand mixer. I mix it together with a wooden spoon or my trusty King Arthur bread dough whisk. When the two loaves comes out of the oven, they should cool on a rack. Heat the glaze on the stovetop while the bread cools for a bit. Then poke holes in the warm bread with a wooden skewer or toothpicks, drizzling the syrupy glaze over the top. It seeps in deep and dries crackly on the top and sides. Mmmmm… this scrumptious bread disappears so fast at my house and it will at yours too! The house smell heavenly, like an almond lemon sugar cookie. It’s easy to make, and goes perfectly with a cup of tea or alongside a main dish salad at lunch or dinner. 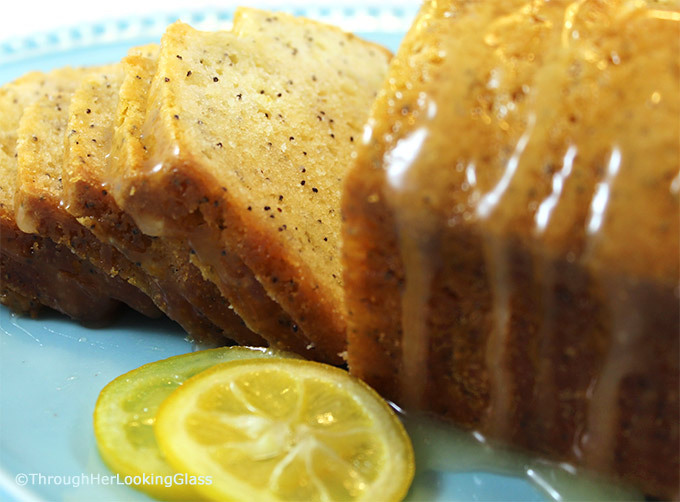 Almond Glazed Lemon Poppy Seed Bread not only tastes amazing, but makes a pretty presentation. 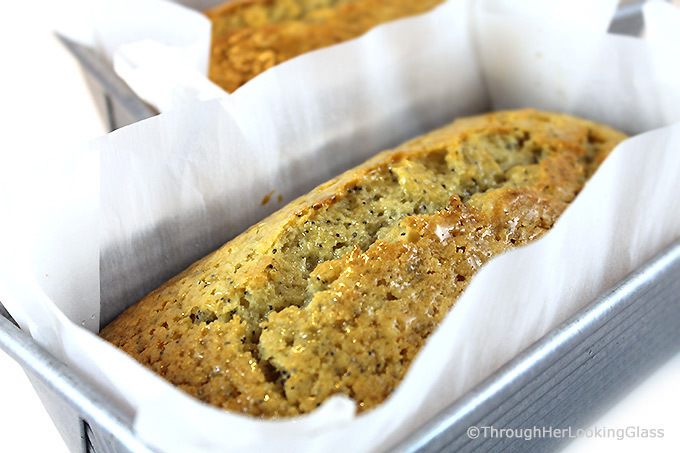 A rectangular serving plate beautifully showcases this yummy quick bread. Use two 9″ by 5″ loaf pans for this recipe. Line the loaf pans with parchment paper for easy clean up. Healthier: substitute liquid coconut oil for the vegetable oil. This recipe makes two 9″ X 5″ loaves. Eat one, freeze the other. If baking in a convection oven, reduce temperature from 325° to 300°. Cool the loaves on a rack for 5-10 minutes after removing from the oven. Stir together the glaze in a saucepan on the stovetop after removing the loaves from the oven. Poke holes with a toothpick or wooden skewer into the top of the bread. Spoon warm glaze onto the warm loaves, letting it soak in. Save a little glaze, it will thicken as it cools. Then spoon over the bread for a pretty presentation. I use my electric knife to cut thin, even slices that don’t fall apart. Combine flour, sugar, salt, and baking powder in a mixing bowl. Stir in eggs, milk, oil, vanilla extract, almond extract and poppy seeds. Stir until just mixed and pour into two greased and floured 9" X 5" loaf pans, or line with parchment paper. Bake at 325 degrees for an 1 hour and 15 minutes or until done. It may take as long as an hour and a half. Cool on wire rack for 5-10 minutes, then spoon on glaze. Heat sugar and lemon juice until sugar dissolves, stirring occasionally. Remove from heat. Blend in vanilla and almond extract. Poke holes in bread that has cooled for 5-10 minutes, then spoon glaze on top. Cool an additional twenty minutes, then remove from the pan. Use medium sized 9" X 5" bread pans. Grease and flour pans or use parchment paper. Watch closely at the hour and fifteen minute mark as the bread bakes. After cooling for twenty minutes, slide a sharp knife around the edges of the bread before removing from the pan. If you have one, use an electric knife to slice the bread. This helps keep the pieces intact. What a great idea, they will love it. Thank you Linda! I wish I were your neighbor so I could conveniently drop by when you are baking. YUM! Yum! I've already had this lemon bread at Allie's house, and it's GOOD! Bringing this very loaf tomorrow morning. :) Thnx. B! Thanks for sharing this. It's a moist bread plus I love the flavor! Thnx. Monica, glad you liked it! Just printed the recipe. Cannot wait to bake and try. It sounds like all my favorites in one. Thanks, Allie. And please...keep the great ideas coming! Tried and true are the best recipes! Will add this to my book and try soon!! Hmmmm, I wonder who gave you this recipe?! A lovely girl I know from the Windy City!!!! It's a joy to share recipes and life with you! This is a yummy one! That looks perfect! You are quite the baker! I have been craving a good ol lemon bread and this is it! Looks so delicious! Wow this looks absolutely amazing! I have some lemons left on the tree that I need to put to good use before it's too late. This recipe is ideal! Love it! Now this, I HAVE to make... I love lemon poppyseed muffins/bread. And that almond glaze on top... sounds like heaven! 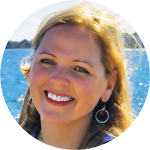 Thank you for sharing :) Pinning for sure! Love the almond glaze you've added to this delicious bread - such a great touch! Your bread looks absolutely scrumptious, Allie! We love anything with lemon here...definitely want to try this...and SOON! Pinning! OH MY WORD! I want to go home and make it RIGHT NOW! 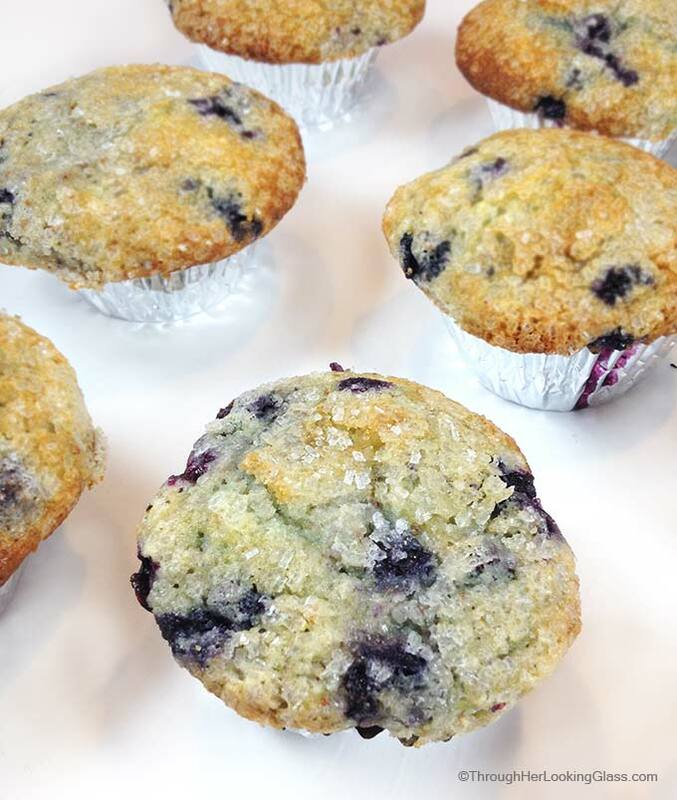 It's my ultimate absolute favorite - though I usually BUY them in muffin form. But I'm going to make this!